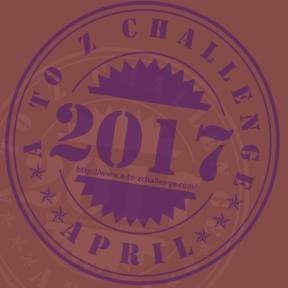 Lloyd of Gamebooks: Want to write for Fighting Fantazine? Hello all! 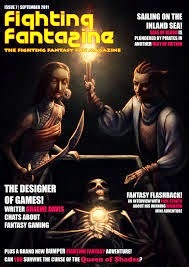 Hopefully, if you read this blog, you will be aware of Fighting Fantazine, a wonderfully crafted fanzine which has gone from strength to strength, and is now branching out to cover even more gamebook series (there will be a Lone Wolf adventure in it). Well, you can now write for it. We are always on the lookout for articles related to gamebooks from a variety of angles. It doesn't matter what they could be about from gamebooks in different countries to the best drink to order from the Black Lobster and why. We will take all kinds of stuff. We also want reviews of gamebooks, new gamebook adventures (most are about 200 sections), Advanced fighting Fantasy scenarios and art. Alex always loves an artist. Have a look at the zines yourself to see what is needed. The gamebooks can use the Fighting Fantasy, Lone Wolf, Tunnels and Trolls or Gamebook Adventures systems. The adventures should be 200 references and 30000 words, excluding rules. You should only submit a treatment (a 1 page summary) first so that Alex can make sure that the adventures are not too similar (so you won't waste your time writing a 200 references and not getting it in the zine). It also has a news section which has grown with the revival of gamebooks. It takes a lot of time to go through all of the gamebook related sites and see what new releases there are, then write them up. However, if there were more people, who only needed to look at a few websites each, then it would really make the job a lot easier. No one would have to spend much time on the process of looking at 5 websites and writing up the gamebook release news. Gamebooks (around 200 sections) using the Fighting Fantasy, Tunnels and Trolls, Lone Wolf or Gamebook Adventures systems. 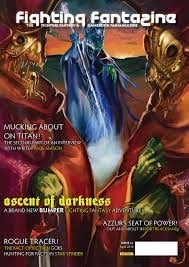 So, if you want to contribute to this popular gamebook establishment, email Alex Ballangall, the editor at editor@fightingfantazine.co.uk.